You have far too many extensions open, and you don't even use most of them! You can't even remember why you added them in the first place! And it is a pain to go into your settings and turn them on and off when needed. Well never fear, there is an awesome extension that can help keep your extensions organized, access your apps, and let you add them/take them off your toolbar with one simple click! This extension is called Extensity. The icon is dark blue with a white circle (similar to a yin yang). 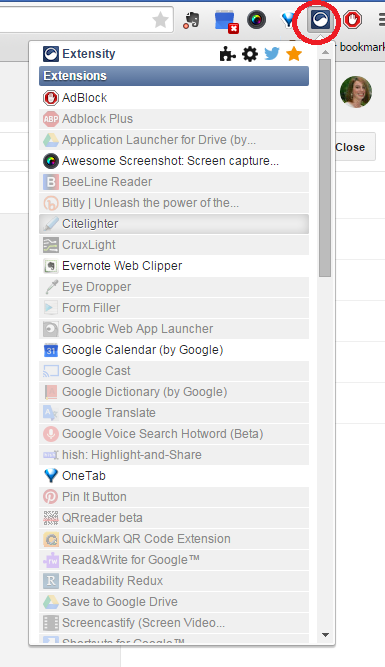 When you click on the Extensity icon, you see a full list of all your extensions, then your apps. To remove an icon from your toolbar, simply click its name on the list, and it will immediately leave the toolbar. To add an icon to the toolbar, again a simple click on the name will bring it back. Add Extensity today, and let me know how you like it!